Like many self-published writers, I’ve been unhappy/dismayed/puzzled at Amazon’s removal of ratings and stars from Also Boughts’ listings, but I might be having a change of heart–I was just looking at the Also Boughts for my most recent novel, One Right Thing, and realized something very refreshing: every title looked as interesting as any other. I recently read a blog post about an author who screwed up 17, 500 free downloads of her debut novel by publishing to KDP using a .pdf version of her manuscript. In short, the conversion to a Kindle-friendly version didn’t quite take and she had to scramble big time to salvage the situation, soothing the angry readers who had already downloaded the book and working overtime to make amends by posting an error-free version. I admire her courage in coming clean about this calamity and admitting that, in restrospect, she should’ve been willing to spend the money to hire an e-book formatter. She was quite clear that she’d paid a price by going cheap, i.e., doing it herself. The post was followed by a (admittedly, small) chorus of support, with one commenter vehemently blaming Amazon for the mixup, while others cited their own troubles uploading their manuscript .pdfs. As a writer published through Amazon’s Kindle Direct Publishing program, I receive a digital newsletter from Amazon with the scintillating title Kindle Direct Publishing Newsletter. The content of the newsletter is fairly bland, including such items as what your payment for borrowed titles will be and the maddening section “Featured KDP Books,” where all I really want to know is how these writers were picked to be featured in the first place. I don’t begrudge these sections too much, since newly published KDP’ers could probably use this information. 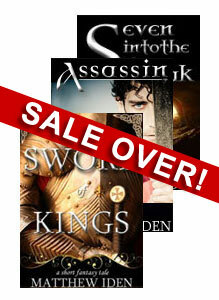 As many of you know, in an attempt to promote some of my shorter fantasy titles, I recently (June 22-26) held a six-day sale of three of my short stories: Sword of Kings, Assassin, and Seven Into the Bleak. I thought I’d give an analysis of what I was aiming for, what I achieved, and some of the lessons learned. Robin Sullivan over at Write to Publish has a nice post about how, as an indie author, you can keep from being left in the cold as Amazon–love ’em or hate ’em–goes about its quest to retain market leadership in publishing (c.f., KDP Select exclusivity, flexing contract muscles on Independent Publishers Group, etc.). It would be foolish to forget that authors’ interests and Amazon’s interests are often ALIGNED, but they are not IDENTICAL. I waxed poetic about this when Amazon announced KDP Select. Diversification isn’t just a good word for crossword puzzles. Whether we’re talking financial investments or outlets for your writing, don’t put all your eggs in one basket. Amazon is the biggest basket, but not the only one. I find those who boycott or hate on Amazon without referring to history or the bigger picture irritating. This is hopping on a bandwagon. Where were those people when traditional publishers kept the majority of authors under their thumb and allowed publishing as an industry to stagnate for the last thirty years? You can recognize Amazon for what it is (a corporate entity running a tight P&L sheet) without pillorying it or hopping into bed with it. Celebrate them when they do good, chastise them (or even fight them) when they do bad. Extremists make life hard.